Wild As The Wind offer a flexible way of buying your favourite essentials oils. They can be a treat for yourself, or you can buy the Essential Oil Starter Kit as a gift for someone else. 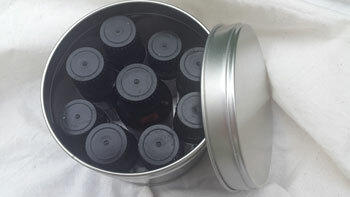 And, if you buy three essential oils or more we will present your order in a lovely metal tin, as a FREE GIFT. This offer is only available whilst stocks last. Please enquire if the tins are still available before you place your order to avoid any disappointment. The perfectly sized matte-finish metal tin has room for nine essential oils when full, so there’s plenty of scope to put together really calming, healing and aromatically beautiful combinations of essential oils… over time..
Or… Are you a returning customer? … Know all of this already? … Or, just want to go shopping? What Is An Essential Oil Starter Kit? An Essential Oil Starter Kit can be one of many things. An Essential Oil Starter Kit can simply be your entry into the wonderful world of essential oils, or it can be the best way of presenting essential oils as a gift. But, before we get ahead of ourselves, and start talking about buying essential oils as a gift, it’s perhaps important to explain exactly what an Essential Oil Starter Kit actually is!? To do that it’s probably best to start with explaining what it isn’t. And, what it isn’t is an Essential Oil First Aid Kit… although, technically it could be… if you wanted it to be. The Essential Oil First Aid Kit is comprised of the same six essential oils that cover you for all emergencies, whereas the Essential Oil Starter Kit is much more likely to be about indulgence as well as one or two oils that will address medical concerns thrown in for good measure. By contrast, the Essential Oil Starter Kit is a random collection of oils, that can be added to as and when desired. What Makes An Essential Oil Starter Kit? An Essential Oil Starter Kit can be simply comprised of one tin, (as featured in the pictures), and a single essential oil if you want it to be. Fundamentally, the Essential Oil Starter Kit is the beginnings of a collection of essential oils, so it doesn’t matter how many bottles are in the tin, or what the oils are used for, as long as the person the starter kit is intended for will love them and use them. Have you been thinking about buying essential oils as a gift but weren’t sure how to present them? If you are going to give essential oils as a gift, you really do need to consider how to present them properly! The beauty of the essential oil starter kit is that it isn’t necessary to buy all of the essential oils required to fill the essential oil tin at one time. Some people may choose to buy two or three affordable essential oils as a gift, placing them in the essential oil tin with some lovely coloured tissue paper. This, of course, is the same principle if you are buying your essential oils as a gift for yourself or for someone else. You can start off your essential oil stater kit with a single essential oil, and you can buy a single essential oil as a gift also. Essential Oils like Organic Sweet Orange Essential Oil and Organic Lemon Essential Oil can be bought for people who love to bake, as they are great for adding as natural flavourings to cakes and puddings in general. Plus they are immensely detoxing. And, if you want to go for the detox tripple, add Grapefruit Essential Oil as well. Adding a couple of drops of each to warm water to be drunk 20 minutes before breakfast will do wonders for your liver and digestive health, as well as your weight-loss regime..
Organic Sweet Orange Essential Oil is mentioned throughout this website as being one of the most healing oils there can be… and it’s incredibly affordable as well. It even fights cancer as well as improving our emotional health, but we recommend you click on the link above to read all of the many healing benefits of this oil. For ideas of how to incorporate Organic Sweet Orange Essential Oil into your daily routine we advise you to go to Morning Detox Protocols. Organic Lemon Essential Oil is vital for cleansing the liver. It contains a constituent that can’t be found in any other food that is essential for second stage liver cleanse. Check out quite how vital an early morning warm lemon drink is for your health in Morning Detox Protocols. Then there’s the best essential oils as a gift for someone who is going traveling. This kit would inevitably include Citronella Essential Oil as a brilliant mosquito repellent that is also antibacterial, antiseptic, antifungal, astringent, as well as being an effective anti-inflammatory. Then, there’s Tea Tree Essential Oil for wounds and as a salve for insect bites, and Lavender Essential Oil for headaches and nervous tension, especially if flying is an issue! If you are going somewhere extremely exotic, where large biting spiders are likely to be a problem, then Peppermint should be add to your travel first aid kit. Peppermint Essential Oil added to water and placed in a spray bottle and used to squirt atomised Peppermint Essential Oil into the corners of the room, and under the bed etc, will repel spiders. But do see how the advice on this page is beginning to really coincide with the essential oils in the Essential Oil First Aid Kit…? It’s difficult to top the Big Six! They really are pretty amazing! When starting out buying essential oils it is tempting to go for the essential oils that are overtly medicinal like Oregano Essential Oil or Tea Tree Essential Oil, but that would be at the expense of a lot of healing oils that help to prevent illness in the first place. Stress is one of the leading causes of illness, and so any remedy that can help mitigate stress will help to keep us well, even during times of adversity. Then there’s oils for mental clarity and mental focus, and then there’s others that simply remind us of a place or time when we felt great about life, and that, when diffused or burned, take us on a trip down memory lane, so we can reconnect with the person we are when we are in a space where we are not harried or overly burdened. There’s oils that reduce inflammation, even in the brain, relieving tension headaches and discomfort so we can sleep better. Sleep is so restorative, that a lack of good quality sleep will likely make us ill over time. The best essential oils for stress are very much determined by the type of stress you are dealing with. The best essential oils for stress in one situation would not be the best essential oils for stress in another. And, the fact is that, a lot of essential oils have the ability to relieve stress. These include some lesser known oils as well as the obvious choice of Lavender and Ylang Ylang Essential Oils. Wild As The wind also recommend Clary Sage Essential Oil, which has the added benefit of helping to balance hormones, as well as Organic Sweet Orange Essential Oil, which is clinically proven to be uplifting, as well as being brilliant for relieving oxidative stress. One of the best essential oils for stress is Rose Essential Oil. Like Sweet Orange Essential Oil, it is clinically proven to be uplifting and is also known to relieve anxiety and depression. The only problem is that it can be prohibitively expensive when bought in it’s undiluted form. Wild As The Wind can prepare a tailor made massage oil, or dilute essential oil for you on request. Just send a quick email explaining what you would like and we will put something together for you. Alternatively, you can call us…. It is, however, included in Wild As The Wind FACIAL OIL No. 2 in good amounts, along with quite a few other de-stressing essential oils, so that may be a consideration if you are very taken with the idea of using Rose Otto Essential Oil. One of the best essential oils for stress is Pine Essential Oil. Pine is excellent for exhaustion, as is Rosemary Essential Oil. But, Rosemary Essential Oil is also important for relieving other forms of stress. It is the best essential oil for using to counter EMF, which is short for Electro Magnetic Fields, or Electro Magnetic Frequencies. Electro Magnetic Radiation is imposing an incalculable burden on our systems… which all add up to a lot of stress! Unfortunately, very sensitive people are our canaries in the coal mine. Anyone who has developed brain tumors are very strongly advised to avoid using modern technologies like mobile phones and other electronic devices, because of the known risk of EMF and cancer. But, as yet, it is impossible to estimate how many people are likely to contract cancer as a consequence of the constant barrage of electro magnetic radiation, and because we are so reliant on the technologies that cause the problem, the chances are if we knew the risks we still wouldn’t want to discard our internet accessing devices. This is why the lesser known Rosemary Essential Oil is likely to be considered one of the best essential oils for stress in the future because It is the most potent essential oil for protecting against EMF. As well as being one of the best essential oils for stress, Rosemary Essential Oil is capable of treating SIBO (small intestinal bacterial overgrowth), a condition that is becoming increasingly more common. This condition places an immensely stressful burden on the system and means that we are not only unable to digest our food properly, but that our hormone health is likely to be completely out of whack too. Rosemary Essential Oil needs to be consumed in enteric coated capsules, that allow the capsule to remain in tact until it reaches the intestines, so that it can go to work to reduce the SIBO. *Shungite is also very effective at combating the negative impact of EMF. Any of the essential oils that treat stress are ideal for adding to a massage oil blend… but then there’s some great oils that don’t fall into this group… Sandalwood Essential Oil and Frankincense Essential Oil are both excellent for focusing the mind, so if you are feeling as though your energy is too dispersed, or your thoughts are all over the place, and that you need to consolidate yourself, then these two oils would be perfect. Wild As The Wind sell a Frankincense and Sweet Orange massage oil that is fantastic for relieving stress, reducing inflammation, and promoting mental clarity. It is way better to make a beautiful smelling aromatherapy oil blend than to wear conventional perfume. There are many toxins in branded perfumes which are neurotoxic, and difficult to detoxify from the body. If we have children, and especially babies, wearing conventional perfume isn’t a good idea. Read more in Essential Oils Versus Perfumes. Aromatherapy oils re simply essential oils, but I wanted to emphasise their aromatic quality in this section, hence referring to them as aromatherapy oils. Frankincense Essential Oil is brilliant for pain relief as it is a great anti-inflammatory. (It is so effective at relieving inflammation, and the pain that goes with it, Wild As The Wind have created a formulation around it, which is sold exclusively for pain and inflammation. It is called Pain & Inflammation Vanishing Oil… so no surprises there! Analgesic Essential Oils are perfect for including in massaging oils because they can help to eliminate the discomfort of painful joints, caused by a range of conditions including auto-immune conditions like Arthritis, Rheumatism, Osteoarthritis, Lupus and Raynaud’s etc. Birch Essential Oil or Turmeric Essential Oil are also good choices where this is concerned, but there are quite a few more analgesic essential oils to choose from. If your pain is muscular in origin then Wintergreen Essential Oil or Eucalyptus Essential Oil may be selected amongst a number of other oils that work their magic where muscular aches are concerned. Read fact sheets about essential oils within the Wild As The Wind Essential Oils In Brief section. It is vital to be aware that the vast majority of essential oils available today have been altered, usually to extend shelf life and more usually to increase profits for the original vendor. Whatever the case, what you can be sure of is that the essential oil adulteration problem has not been created for the benefit of the consumer! Why Do You Need An Essential Oil Starter Kit? The reality is you don’t actually need an An Essential Oil Starter Kit, but, out of all the multiples of things you really don’t need on planet earth, this is by far and away one of the better ones.